The wastewater and water treatment sectors account for as much as 3% of electricity use in the U.S. Nationwide, wastewater and drinking water treatment plants spend $4 billion a year on energy to collect, treat, pump, clean, and deliver water. A variety of energy efficient equipment, technologies, and operating practices are available to achieve energy conservation and reduce energy costs. Energy use at wastewater treatment plants is typically the largest, single energy consumer for a city. Within the plant, energy is the second largest operating cost after labor, and has the greatest potential for reduction. A number of tools exist to assess energy use and to identify opportunities for reduction in activated sludge, wastewater treatment operations. To estimate potential energy savings, compare the facility’s energy consumption with other plants by using the new Wastewater Plant Benchmark tool in the Minnesota B3 online tools. This tool is based on the Energy Star wastewater treatment plant benchmarking program, but in an easier to use and more informative format. 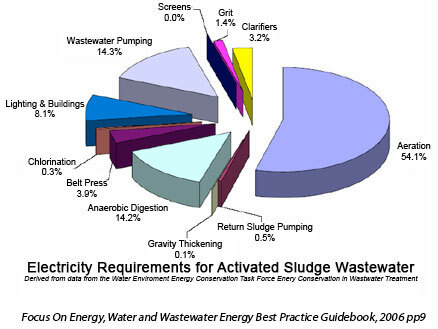 See “Energy Benchmarking – A Tool for Wastewater Treatment Plant Efficiency” for more information about benchmarking. Estimate power consumption for the three to five largest electrical draws and take a closer look at how these operations are run to identify cost reduction possibilities. Look for large motors with long run hours. Typically, these are aeration blowers or equipment, or large pumps. The combination of these draws should consume at least 70% of the total plant electricity. See the discussions of operations below for cost reduction options to consider. Determine how electrical loads can be shifted to off-peak hours. For example, shut off discretionary equipment during peak hours. This is only useful if your bill includes a demand charge based on the highest electrical use during a billing period. Use a real-time electrical meter display to monitor electrical consumption as discretionary or intermittent loads are added. Another option is to turn large loads like blowers off before turning the next one on when cycling equipment to equalize operating hours. While working towards reduced energy consumption, make small, incremental adjustments to plant operations to ensure adequate treatment performance. Evaluate how improved or additional process controls can contribute to greater efficiency, such as DO control, UV pacing, or energy consumption (amps or kW) readouts on important equipment. Secondary aeration systems are likely the largest source of energy use in a plant (40-60%). Check the aeration system to determine if it is properly sized and delivers the required aeration. Dissolved oxygen (DO) concentration in the range of 0.5-2 mg/L is required for adequate activated sludge treatment – DO above 2 typically suggests wasted aeration energy. Operating at DO>5 gets expensive. Use right-sized blowers, with adequate system turn-down to maintain low DO’s. A good system turn-down target is 8:1. When multiple blowers need to operate, be sure controls maximize their operating efficiency. For oxidation ditches, if DO remains high, first look at minimizing rotor speed and immersion depth, then consider turning the rotors off intermittently. Consider automatic DO control as a means of maintaining a consistent, low aeration rate. Consider replacing coarse bubble diffusers with fine bubble diffusers. Increasing oxygen transfer efficiency with fine bubbles reduces energy costs. More efficient aeration will require blower adjustment at a minimum and may require smaller blowers. Shut aeration basins off when not needed. This is important when minimum mixing or minimum diffuser flow requirements prevent achieving low DO’s. Removing excess capacity can also reduce MLSS and long residence times that can degrade the health of return active sludge. Look at removing capacity if plant loads are small compared to design capacity. 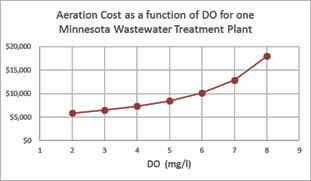 Hutchinson saves $40,000/yr by keeping their second oxidation ditch out of service. simplify and shorten the piping if possible. These changes will generally require the aeration rate (e.g. the blower speed to be reduced. The goal of MOV control is to avoid excessive throttling on the discharge side of the blowers. It is inefficient to build pressure, then waste it across throttling valves. Throttling should be limited to what is required to properly split the air flow by ensuring the control valve serving the zone with the highest oxygen demand is essentially full open1. St Cloud has successfully implemented MOV saving $27,000/yr. Reduce air generation to maintain low DO’s rather than venting excess. For effluent aeration, consider using elevation (outfall) drops, or small, stand-alone aeration systems operating at low pressure. Aerobic digesters are typically the second largest electrical load (10-30%) when present. Test biosolids to determine when it becomes stable, aerate only as long as necessary. Consider using the Standard Oxygen Uptake Rate (SOUR) test. Try intermittent aeration to reduce the hours of blower operation. There are plants successfully using 5 minutes per hour or one day per week intervals for biosolids stabilization. Test what works best to reduce energy while adequately stabilizing biosolids by incrementally reducing cycle times. Use a VFD to vary air delivery with the depth (volume) present in storage tanks that are filling. Leave blowers off after emptying digester tanks. When the level of biosolids are low, aeration effectiveness is low. Aeration is commonly unnecessary for up to a few days for nearly empty tanks, and when they are just beginning to fill. Anaerobic systems generate biogas which can be burned to generate heat energy, and sometimes electricity. This makes anaerobic digestion a source of renewable energy that can potentially generate more energy than the digestion operation uses. All plants with anaerobic digestion can use biogas for seasonal heating use. In some cases it may be possible to increase utilization by providing surplus gas or hot water to a nearby consumer or to compress the gas for use in natural gas-powered vehicles. Optimize digester temperatures for maximum biogas generation – each microorganism has an optimum temperature range where they are most active. Anaerobic digesters should be used in conjunction with primary clarifiers to bring the most potent biosolids directly to the digester. Consider bringing high strength wastes directly into the digester from industrial and commercial sources to increase gas production. After aeration equipment, pumps are generally the next largest consumer of electricity. For additional information, visit the U.S. Department of Energy for pumping tip sheets and resources. 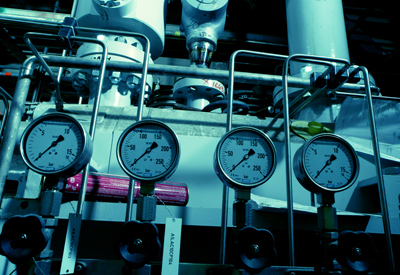 Determine if pumps are properly sized for their application and load variations. Use pump efficiency curves to identify best operating points and operate pumps close to those conditions. Determine how pump controls can be adjusted to run pumps nearer their best efficiencies for systems with multiple pumps in parallel. Look for ways to reduce the pressure head. Consider opening throttling valves, using VFDs to reduce velocities, or raising sump levels. Replacing standard efficiency motors with energy efficient models will save money, but the impact per motor is generally small. Conduct a motor inventory to understand the number of motors of each type and application. Determine which motors are interchangeable. Develop an emergency, premium efficiency motor replacement plan and purchasing protocol. Motor failure is the best time to invest in more efficient motors. Be prepared by keeping a critical motor inventory and identify more efficient alternatives early. Some utilities provide added incentive for motors achieving efficiencies higher than NEMA Premium. Check with the local utility before purchasing new equipment. Establish criteria for replacing or rewinding motors. Strongly consider replacing motors that have been rewound more than once. Develop or evaluate your motor maintenance program. Lighting is generally a moderately small load at treatment plants, but direct electrical and maintenance savings, along with utility incentives can make lighting changes attractive. Turn off lighting in unoccupied spaces. Improve the efficiency of indoor and outdoor lighting. LED lighting costs have decreased and they are reliable, efficient, and low maintenance. Use a light meter to verify light levels. If areas are over lit, are there opportunities to de-lamp or disconnect unneeded fixtures. Intern Summary: MCES improves aeration process to reduce energy use (2010). Wastewater treatment plant MCES completed an aeration reduction process with MnTAP and MCES interns which resulted in first year total electrical savings of $775,000. Another six million kWh/yr reduction may be added in 2010. S. EPA: The Energy Use Assessment Tool can be used by small- to medium-sized systems to conduct a utility bill and equipment analysis to assess individual baseline energy use and costs.